Looking for a product that perfect for your thinning hair? Try the Nioxin’s System kits! They have a unique blend of chemicals that can help you to regrow your hair and make the hair you currently have healthier and stronger. 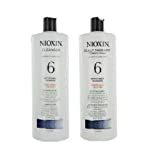 System 4 is one of Nioxin’s unique six systems that can help your hair be everything it can be. Who is System 4 Designed for? What makes System 4 Unique? 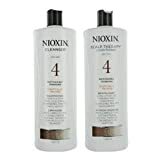 Nioxin System 4 is for people with fine hair that are starting to see “noticeably thinning” spots in their hair. 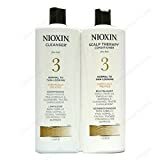 The Nioxin System 4 is designed to help regrow hair by making your scalp healthier and cleaning out all of the gunk that is blocking your pores. Nioxin has been around since 1987 and has loads of scientific research to back up their products. They have been proven again and again to work with all kinds of different hair. Another feature about Nioxin System 4 that I really love is the three-part system. It combines powerful technology with natural products to really make your hair strong, healthy, and to make your hair stick around longer, too. It’s like a miracle product for those with thinning hair! System 4 is designed for people with fine hair, so I picked this one for myself. I was instantly shocked by the really minty smell. It’s pretty pungent inside of the very small space that is my shower, but it isn’t a bad smell. I got used to it after the first week or so, but your first whiff will probably shock you almost as much as it did me! The shampoo works really well as a shampoo all by itself; it leaves your hair feeling clean and fresh. 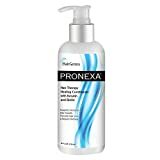 The conditioner is light and moisturizing, and it feels really good against your scalp. The leave in scalp treatment was a little strange at first; I was afraid it was going to feel gross or crusty after my hair dried, but it doesn’t feel that way at all. All in all, I felt like I had some really amazing hair products that made my scalp feel all tingly and alive. But would it help regrow my hair and keep me from losing more? Spoiler alert: it did! System 4 is designed for people with noticeably thinning hair. It’s meant for hair that has been bleached or colored, permed or straightened. System 4 is also best used by people with fine hair; if you have normal or thicker strands, you should stick to the other Systems. Use these products daily! The shampoo is used like regular shampoo then rinsed thoroughly. After that, apply a dollop of the conditioner to your hair and then let it sit for 1-3 minutes before rinsing. Once you are out of the shower, rub some of the scalp treatment into your scalp, then brush in through the rest of your hair. Then you style like normal and go! 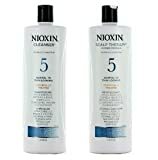 System 4, like all of Nioxin’s System kits, has some unique technologies to help regrow and add health to your locks. Scalp Access Delivery System: This technology adds an all-day SPF 15 to your hair and scalp, protecting it from the sun. It helps to keep your scalp clear of pollution and damage, providing the best environment for your new, healthier hair. BioAMP: Using something called cystine amino acids, BioAMP amps up the thickness of your strands to make every single fine strand of hair into a thicker, healthier, and more manageable strand. Bye bye, breakage! Glyco-Shield: This shield helps to build a wall to protect the already fragile hairs due to chemical treatments at the salon. Color, bleach, straightening, and more causes damage, and System 4 is here to help. 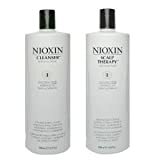 Nioxin is backed by some sound, hair regrowth science that has been proven to help many people regrow their hair. If it has worked for millions (including me! ), it can work for you too. 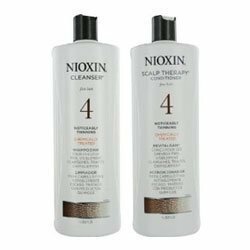 Nioxin System 4 is built just for your fine hair, making sure your strands won’t suffer from chemicals made for thicker hair. These Systems are much, much cheaper than any other hair regrowth treatment out there, and it works. There is really no reason not to give it a try if your hair is thinning and you want a way to keep it. Although Nioxin has subjected their products to loads of trails, there will always be people that have adverse reactions to any chemical they put on their skin. Be cautious trying Nioxin the first time; try just a little bit to make sure you aren’t one of the small minority of people that have an adverse reaction. I loved this kit! It really works, making my hair feel fuller and healthier. I’ve been getting nonstop compliments on the shine in my hair. It looks amazing, and I think some of the spots I’ve had are starting to grow back in. I can’t be happier with the product. If you have fine hair and have noticed some thinning, don’t wait. Try Nioxin out today.